The slides of the “OAuth 2.0: Theory and Practice” Codebits 2012 session, that I co-authored with Daniel Correia, are available here. This entry was posted in Uncategorized on November 27, 2012 by pedrofelix. Last week, Vittorio Bertocci announced the developer preview of the new JWT Security Token Handler, which provides support for a important piece of the modern identity and access control management puzzle. Integrity – the authorized receiver should be able to detect any modifications to token, while in transit between the two parties. On Web Single-Sign On protocols, security tokens are used to securely transport the identity information from the identity provider to the identity consumer. On a delegated authorization protocol, such as OAuth 2.0, security tokens can be used to convey the authorization information from the client to the resource server. For instance, the SAML (Security Assertion Markup Language) assertion is an example of a very popular token format, used by Single-Sign On protocols such as: Shibboleth, the SAML protocols and WS-Federation. SAML assertions are XML-based and use the XML Digital Signature and XML Encryption standards for providing integrity and confidentiality. The header defines the token cryptographic protection, which is ‘none’ in this case. The JWT Claims Set object is a container of claims, where the object’s property corresponds to the claim type and the property’s value contains the claims value. Some claims types are defined by the JWT spec (e.g. “iss” and “exp”), while others are context specific (e.g. “http://example.com/is_root”). We will see more examples of JWT tokens after presenting the JWT Security Token Handler. What are Security Token Handlers? Create a token from a token description. This behavior is defined by the abstract SecurityTokenHandler class, with multiple concrete derived classes for each token type (e.g. the Saml2SecurityTokenHandler class). 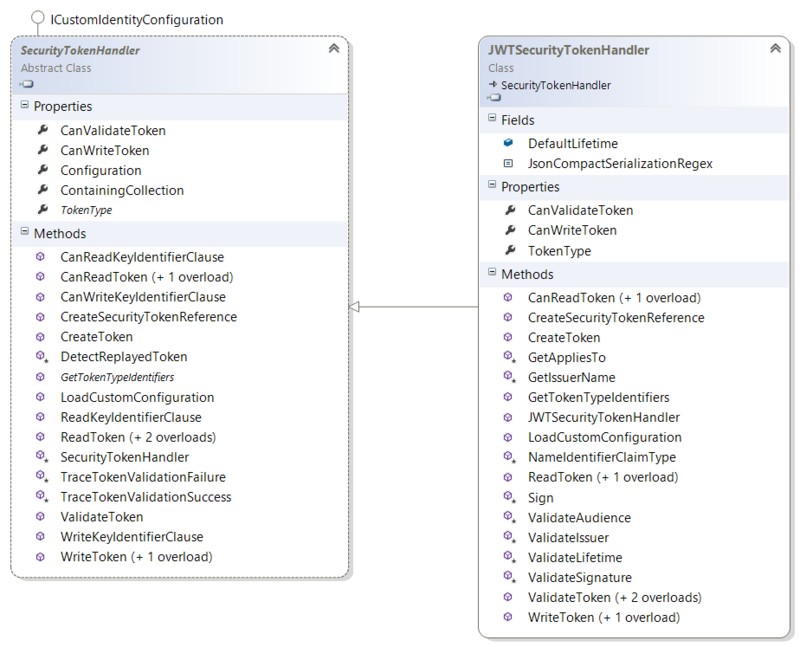 The recently announced Microsoft.IdentityModel.Tokens.JWT NuGet package contains a new token handler for the JWT token format – the JWTSecurityTokenHandler class – depicted in the next diagram. First, we create a token handler and a symmetric key, that will be used by both the sending and the receiving party to sign and validate the token, respectively. The token descriptor also contains the signing credentials, namely the symmetric key and the MAC (Message Authentication Code) algorithm identifier (“http://www.w3.org/2001/04/xmldsig-more#hmac-sha256”). Then, we use the token handler to create the token from the token descriptor. We also use the token handler to serialize the token into a string. The allowed audience, i.e., the value defined in the AppliestoAddress property of the token descriptor. This value should be an identifier of the receiving party. The validation cryptographic, in the form of a BinarySecretSecurityToken containing the shared symmetric key. The name of the accepted issuer. Finally, we use the token handler to simultaneously deserialize the token, validate its signature and extract the contained claims into a claims principal. We end the example by asserting that the claims principal does contains the Name and Role claims inserted in the token by the issuer. The serialized token is just the concatenation of three base64url encoded parts (line breaks added for display purposes). Finally, the third part is the signature value, computed by the MAC algorithm over the first two parts. This entry was posted in Software and tagged claims, JWT, WIF on November 27, 2012 by pedrofelix.